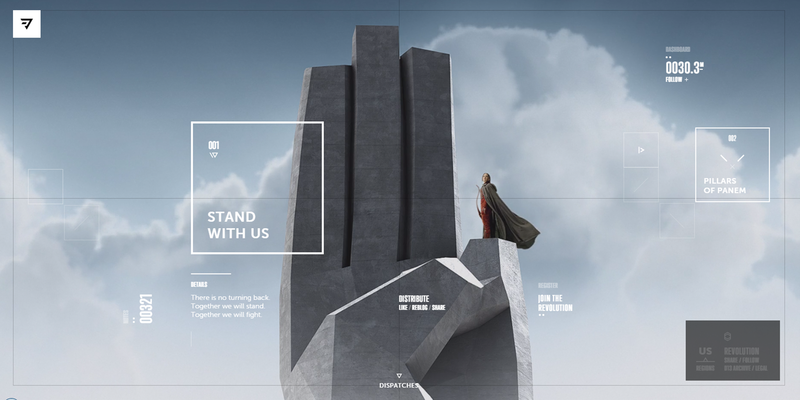 With each new Hunger Games movie, there is (at least) one new website launched that has a cool, in-universe style. From TheCapitolTour.pn (now offline but captured here), Capitol Couture, TheCapitol.pn, to district13.co.in there’s been a whole lot of digital real estate tied to the movies not even counting the “real world” marketing sites of hungergamesexplorer.com (RIP) and the current hub thehungergames.movie. With this track record, no one was surprised when revolution.pn launched a few months ago. As the official digital home for Panem’s revolution, THE REVOLUTION REALLY WANTS YOU TO JOIN THE FIGHT (by providing your email address or linking your Facebook account) and then sharing the various propaganda of the cause, like the Rhythm Nation-esque propo. We wonder what the future plans for this site are, because they’re spending a lot of time trying to drive people to sign up. At least once a week, there’s a message released on socials about joining the cause. This message is from today. We spy a new hashtag in that one too. This may be a tease of some new social campaign or a maybe a release of new posters. We hope it means something new content-release wise, because we get cranky when long, drawn out teases result in nada.